Retinoids are often used to treat blackheads (open comedones), pictured above. They are also used for wrinkle prevention and other forms of acne. 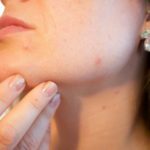 Are you on a topical retinoid for blackheads, whiteheads, other types of acne, or for wrinkle prevention? If so, this post might be helpful for you. There are many different types of topical retinoids, e.g. tretinoin (brand names: Retin-A, Retin-A Micro, Renova), tazarotene (brand names: Tazorac, Avage) or adapalene (brand name: Differin). – Use the medication at night. – Start with application every third or every other night. Work your way up to every night. – Mix the medication with some face lotion to dilute it, or apply face lotion after applying the medication. – Use a small pea-sized amount for the whole face. All you need is a thin layer. – Creams are less drying than gels or solutions. If these tips don’t work, let your doctor know. It may be time to change to a different formulation or medication!